When you make changes to a quiz's player, those changes get saved within the quiz project file. But Articulate Quizmaker also lets you save the player on its own, so you reuse it in other quizzes you build or share it with other content developers. In this tutorial, we'll show you how to save a player, how to apply a previously saved player to a quiz, and how to import, export, and delete players. Save: Use this option to save the player under its current name. 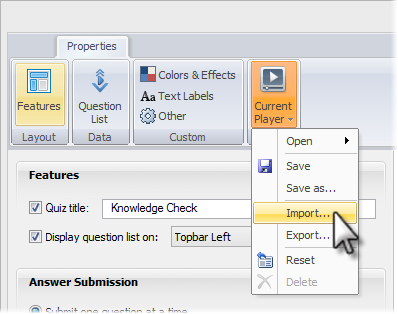 If you haven't saved the player before, Quizmaker will ask you to enter one. 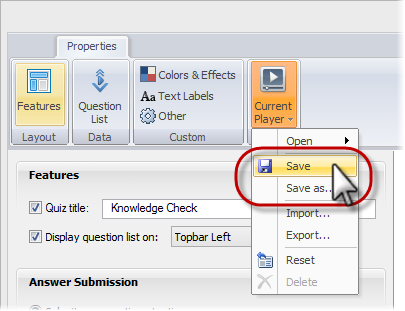 Save As: This saves a copy of the current player under a new name, which Quizmaker will prompt you to enter. This is a good option when you've customized a player but you want to create variations of the same player later. Click the OK button to close the Player Properties window when you've finished modifying your player. If you click the X in the upper right corner of the window instead of clicking OK, your changes will be canceled. In other words, the X in the upper right corner performs the same function as the Cancel button. When you save a Quizmaker player, it gets stored as an *.xml file on your local hard drive, and it gets added to the list of available players you can apply to any quiz. 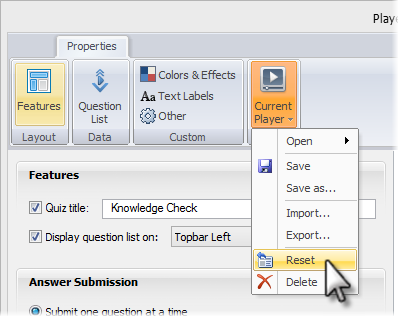 (See the next section of this tutorial to learn how to apply a saved player to another quiz). The location of the *.xml file depends on which version of Windows you're using. When you save a player, you can apply it to other quizzes. To do that, click Current Player, scroll to Open, and choose the player you want to apply to the quiz. 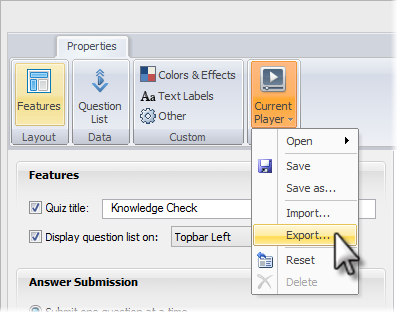 The default Quizmaker Player will always appear in the Built-In section at the top of the list. Any Custom player whose name is followed by "(on disk)" has been saved to your hard drive. A player name followed by "(in project)" is stored only within the current project and hasn't yet been saved under its own name. On the Player Properties manager, click Current Player and choose Export. Enter a name for the exported player (it defaults to the player name you've used in Quizmaker, but you can enter a different one). Now you can give the file to a colleague, or use it on another computer. For instructions on how to import the file, see the next section of this tutorial. On the Player Properties window, click Current Player and choose Import. Browse to the *.xml file for the player you want to import, and click Open. This applies the player to your project. If you'd like to save the player so it's available for other Quizmaker projects, use the steps we covered earlier in this tutorial for saving your player. If you no longer need a player you've previously saved, you can delete it. 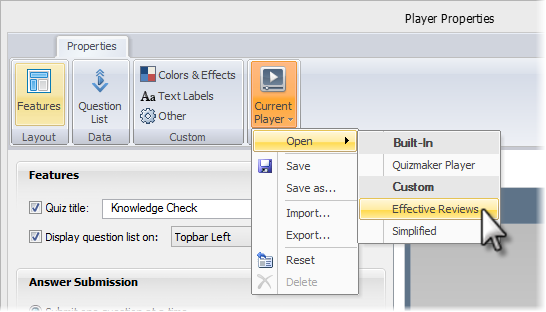 On the Player Properties window, click Current Player and choose Open. Scroll through the list and find the player you want to delete. Click it to apply it to the current quiz. Click Current Player again, and this time choose Delete. Respond Yes at the confirmation prompt. 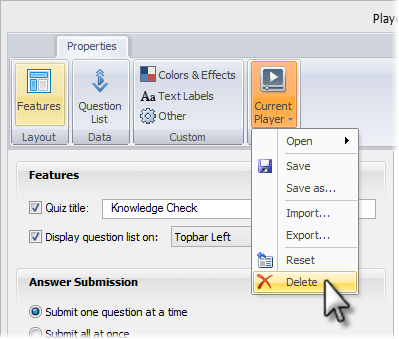 This deletes the player and reverts your quiz back to the default Quizmaker player. If any other quizzes you've built happen to use the player you deleted, it'll remain saved within those quizzes; it'll just be saved within the project rather than as a separate player file on your computer. Let's say you've saved a player and then made some additional modifications, but you haven't yet re-saved the player. Although the additional modifications will stay within the current quiz file, they're not saved to the actual player file yet (and won't be reflected in other quizzes that use the same player). If you want to revert back to the previously saved version of the player, click Current Player and choose Reset.